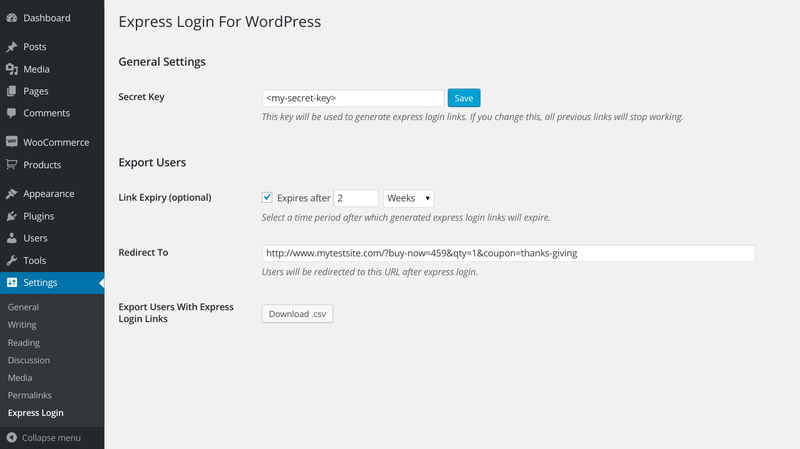 Secret Key : This allows you to set a secret key using which Express Login generates Secure links for customer’s to log in. If you change this, all previous links will stop working. Link Expiry (optional) : This allows you to set validity period until which Express Login links are valid. Login links will automatically expire after the time lapses. Redirect to : It allows you set the page that you want users to redirect to after the Express Login link is clicked. You can also place a Buy Now link with a coupon. Export Users With Express Login Links : It allows you to generate a CSV file of all your users with their login links and send those links via email (Use your favorite email / newsletter service if you wish, and merge the express login link wherever you want). You can store them for your reference also.